Late yesterday afternoon they ran about four hours of water so we jumped in the boat about 5:00PM for an evening of streamer fishing with our friend Chuck Farneth. Six weight rods, one with a floating line and one with 250 grain 20 ft. sink tip, a short five foot leader and a #4 “Chuck’s Chunk” let the boys cover the whole water column. 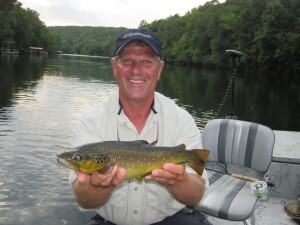 On this beautiful summer evening the guys released over a dozen slot limit Brown Trout. 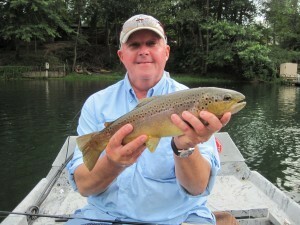 To learn more about our big streamer fly fishing techniques just book a trip with us at Empty Creel Fly Fishing Guides and Outfitter. The fall season will be here before you know it so don’t wait too long to book a prime date for you next trip.